Idiot Lights - which is which? I SWEAR the red idiot light on a bug is the oil pressure . . . right? So the white idiot light came on and I thought, "I get it home right after I go buy an alternator (more on that later). I get home and just before starting the tear down, I thought I'd verify. Rob and Dave's Aircooled says the left (red) light is electrical and the right (white) is oil (unless someone has 'rewired' it ala Tim the Toolman Taylor. Anyway, there's oil in the case (probably time to change it) and the oil pressure indicator is wired tightly. Nothing obvious there. So, am I returning the alternator I just bought and looking for oil-pressure issues instead? As long as I have your attention, how do I tell if I have an alternator or generator? The unit now on the car has no obvious regulator (the little silver box sitting on top of the generator) but has a plastic housing about 3/4" thick, about 2" x 3" with the wire to/from the battery and a wire to the coil. Sounds like an alternator setup, right? If someone can remind me how to upload a picture, I'll post one. BTW, gonna try to make it to VW Invasion on Sunday! 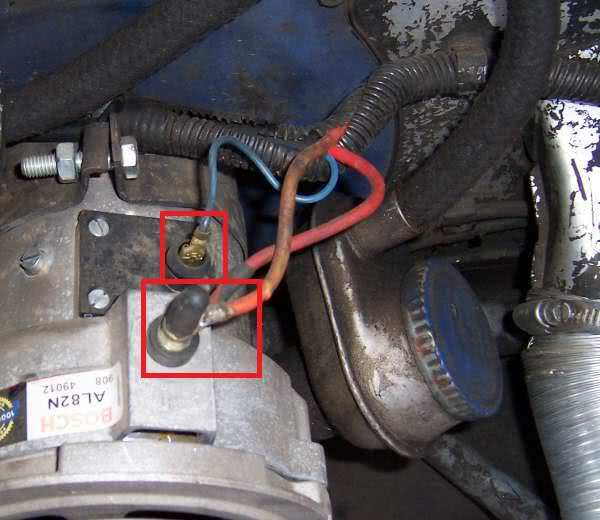 That diagram points to my having an alternator, based on the lack of a voltage regulator. I guess the basic question is still, is the white (right) idiot light the oil pressure or the alternator/generator? If it's the alternator/generator, I can swap that out in an hour or so. If it's the oil pressure, then what? There's oil in the pan and the wiring looks intact. I can do more checking of that tomorrow. LEFT ONE HAS A RED SPOT IN THE HOUSING AND IS ALT/GEN LIGHT. RIGHT ONE HAS A GREEN, SOMETIMES RED SPOT IN THE HOUSING AND IS THE OIL LIGHT. SOUNDS LIKE YOUR COLORED SPOT IS MISSING. NO BIGGIE THO. GO TO THE BACK OF THE SPEEDO ASSEMBLY, LOOKING AT THE BACK SIDE OF IT THE SOCKET ON THE DRIVERS SIDE (WHAT IM GETTING IS YOUR RED LIGHT) SHOULD HAVE A BLUE WIRE TO IT FROM THE ALT/GEN. THE ONE ON THE PASSENGER SIDE (YOUR WHITE LIGHT) SHOULD HAVE A BLUE AND GREEN WIRE TO IT. MAKE SURE YOUR GROUND CONNECTIONS ARE ALL GOOD THERE. MAKE SURE THE CONNECTION AT THE OIL SENSOR IS SOLID AS WELL. IF YOU HAVE GOOD OIL LEVEL AND IT HAPPENS AGAIN YOUR SENSOR MAY BE GOING BAD. NOT A HARD OR EXPENSIVE REPAIR. RENT ME & MY 91 DODGE DIESEL, TOWBAR, OR FLATBED CAR TRAILER FOR ONLY $1.00 A MILE!! I'll check those things out when I get home this afternoon. thanks. I guess my logic is just backwards - I'd think a red light meant STOP RIGHT NOW!!!! what you would want to do if you lose oil pressure as opposed to a white/green that implies, 'there's a problem but don't sweat it until you get home'. Changed out the oil pressure switch and I'm good to go! And NOW I know which light is which AND not to ask for a '67 alternator cuz the guy sold me a generator. Just ask for an alternator next time. Subject: Re: Idiot Lights - which is which?